Geeklist is hosting a global hackathon from Sept. 12-14th to get smart people thinking and creating solutions to our world’s most pressing climate problems. I created a challenge on Pursuitery to help bring more awareness to the hackathon and to participate virtually from the comfort of my home desk. 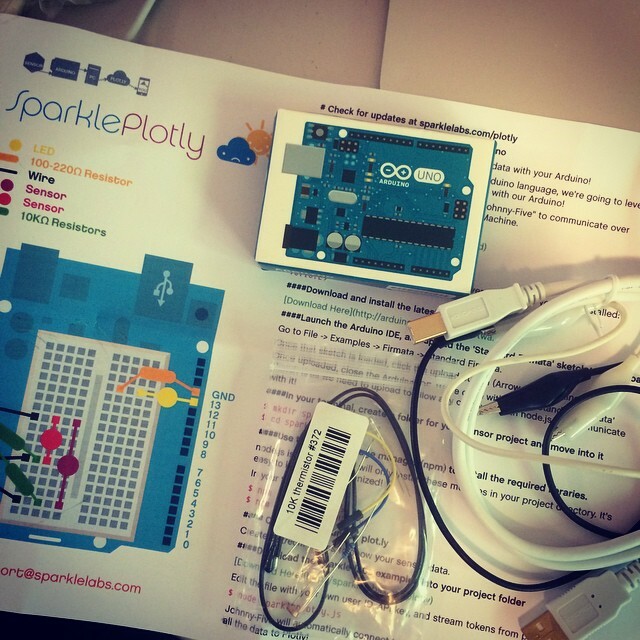 First: I am putting together the Sparkle Labs Sparkle Plotly kit that I purchased at the HOPE Conference in NYC this past summer. It’s purpose is to graph light and temperature data in real time collected using Arduino plus sensor circuits and then upload to Plotly for anyone to see. If more people were collecting real time data about their environment and sharing it then we would have a much more micro view into what’s happening with our environment and would hopefully be more motivated to make a change. Second: I’ve been thinking about is creating a visual simulation of how the world would be affected if more people participated in Meatless Monday. What would the world look like if 1% more participated, 10%, 20%, 100%. I am starting to collect data focused on cattle because they have the most significant impact on California and it’s water shortage right now. Domestic livestock such as cattle, buffalo, sheep, goats, and camels produce large amounts of methane (CH4) as part of their normal digestive process. Also, when animals’ manure is stored or managed in lagoons or holding tanks, CH4 is produced. Because humans raise these animals for food, the emissions are considered human-related. Globally, the Agriculture sector is the primary source of CH4 emissions. I’d love to hear if you are also thinking about climate awareness, adaptation and action. Digital activism – What digital tools can we give to savvy activists and campaigners that will unlock the potential to create powerful movements for climate action? I'm a Canadian-American living in Tokyo exploring the intersection of the environment, education, and well-being. I founded kithub.cc and lamakerspace.org.